This Tropical Smoothie recipe features pineapple, bananas and coconut milk. It makes a super delicious treat on a hot Summer day! My go-to smoothie has always been strawberry and banana, but this Tropical Smoothie has become a new favorite. I’m not even a super huge fan of pineapple, so that’s saying something. It just tastes so amazing, especially after a tough workout. 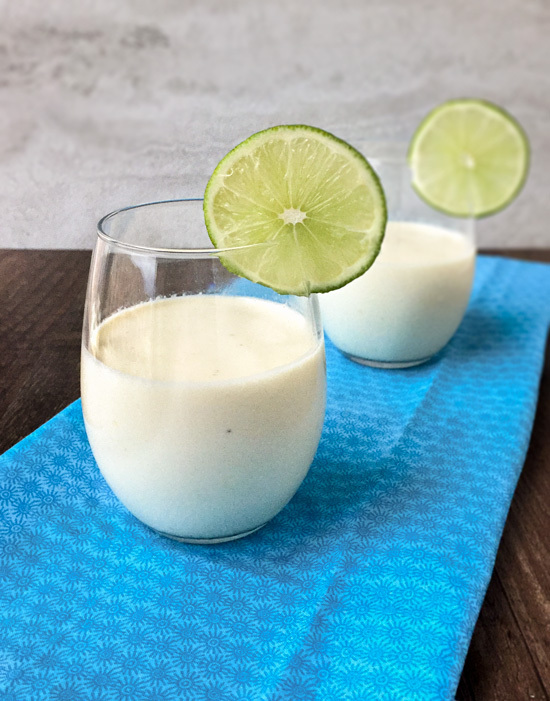 The idea for this Tropical Smoothie recipe came from a Mexican food issue of Cuisine at Home magazine. I made some changes to suit my own taste, and it is absolutely yummy! It’s the perfect treat for those hot Summer days that will be here before we know it. I use the Natural Value brand of canned, un-sweetened full-fat coconut milk. It’s GMO-free and has no added Guar Gum. If you’d like to read more about it, here’s some great info on coconut milk nutrition. I’m not really a fan of the coconut milk in cartons located in the refrigerated section of the grocery store. Canned light coconut milk is a little thinner in consistency than the other because it has some of the fat removed. I’m not sure how much difference it would make if you use the light instead of the full-fat. While it does have health benefits, it is still higher in calories and fat than regular milk. 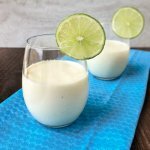 Because of that, I consider this Tropical Smoothie recipe to be more of an occasional treat than something I’d have everyday, but what a treat it is! Whip up this Tropical Smoothie for a super refreshing snack or treat on a hot Summer day! I use packaged frozen pineapple, but freeze my own bananas. Overripe bananas are best in flavor. Slice up a banana, lay out in a single layer on parchment paper-lined cookie sheet and place into the freezer overnight or for several hours. Transfer to a freezer-sage bag once frozen, if not using right away.